In light of recent events regarding the security of online password managers, it’s worth a look at some of the alternatives out there, and the advantages and disadvantages of each. I’ve been using password managers on devices I carry around with me for almost 10 years now. When the first iPhone came out, I remember wanting one, but the reason I did not get one was because there were no third-party apps. I was a long-time Palm (s hpq) owner and had a Treo 650 running SplashID. I have well over three hundred accounts, combinations, locks, and little secret bits of information to manage. So I was excited when I saw that Apple (s aapl) was going to support third-party apps. Use a search term to find a collection of apps that suit your needs. On the iPad, iPhone and Mac App Stores, filter out everything but those ranked four stars and above. Ignore the free apps (everyone rates free apps higher because they are free). And there you have it: a short list made up of 1Password, mSecure, and DataVault. Keep in mind that I also took the number of comments across all versions into consideration, as well as the fact that there was an iPhone, iPod and Mac version available. 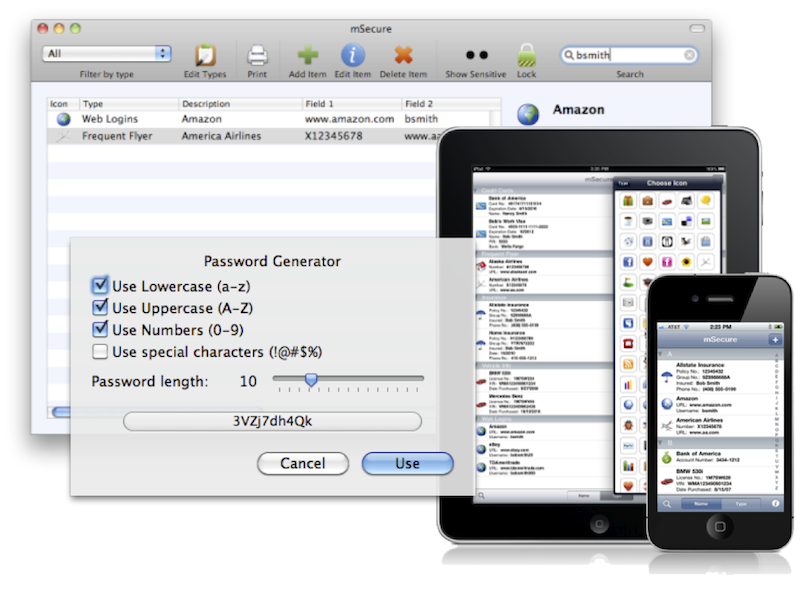 mSecure ($14.99 for Mac, $4.99 for iPhone/iPad). On the surface, it appears to meet all my minimum requirements for a password manager. Data is secure with 256-bit blowfish encryption. There is an iPhone, iPad and Mac version. All three versions can automatically generate strong passwords. It supports multitasking on iOS devices, and you can sync data from one account to multiple iOS devices. The multitasking support is what I really noticed. mSecure doesn’t get too fancy with protecting your data in a multitasking iOS environment. mSeven’s mSecure has the multitasking transition down and have successfully implemented a working auto-lock feature. After porting my data over from SplashID into mSecure, I found I had other needs as well. I wanted categories and the ability to customize field names on an item without having to create a new type. There is the ability to create custom types, and in these custom types you can define any number of fields you like. Overall, for a $20 total investment, it’s a solid offering and has everything one needs to manage their passwords effectively. DataVault ($19.99 for Mac, $19.99 for iPhone/iPad). Stepping up in both price and features, Ascendo’s DataVault is a solid performer as well. If you want more control over your secure items, and you can handle a little more complexity in order to get that control, then DataVault is the tool for you. It has everything the mSecure has to offer and a little bit more. mSecure’s concept of types is akin to DataVault’s implementation of templates. DataVault also has types and even categories, but these are used more for organizing records than defining them. It was the user interface that left me wanting. Pardon my saying, but the app was more Android (s goog) than iPhone. I had all the features and control I wanted, but the look and feel, while certainly high-res, was a little rough around the edges. After using DataVault for a while, I actually started to prefer mSecure’s simplicity, and was convincing myself that the control I thought I wanted, wasn’t what I wanted at all. 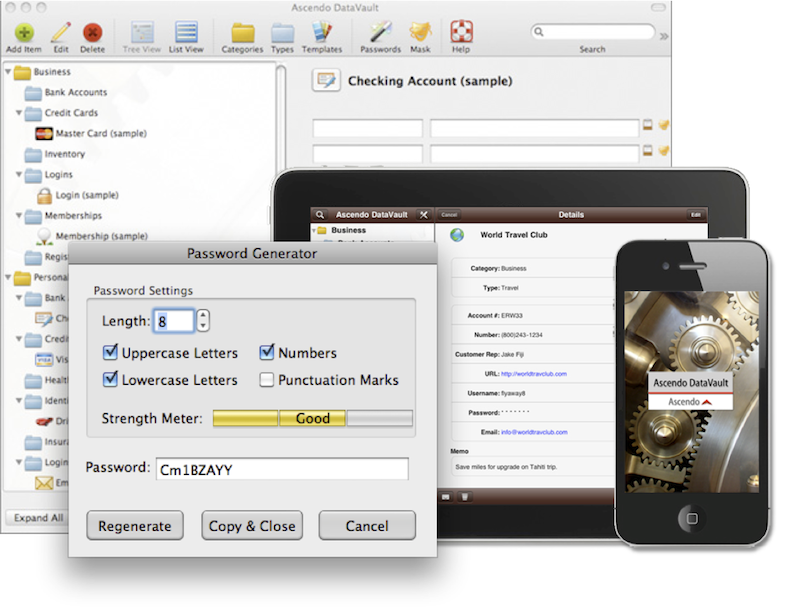 1Password ($39.99 for Mac, $9.99 for iPhone, and $9.99 for iPad). Weighing in at a whopping $60 for the bundle, 1Password is definitely the most expensive of the three solutions. There’s a universal iOS version for $14.99 if you need both iPhone and iPad versions. This is the only one of the three that is not for sale via the OS X Mac App Store, which means you’ll have to purchase additional licenses to run it on multiple Macs (a family pack is available for $69.99). 1Password is very different from the others in that you are almost forced to live with a limited set of ‘vaults’ to store your secure items in. But you can customize each and every item by adding fields and renaming field names. The workflow for creating a new item takes some getting used to. Since the only way to generate a strong password is to create a password item first, then create the full item you really care about in one of the vaults. 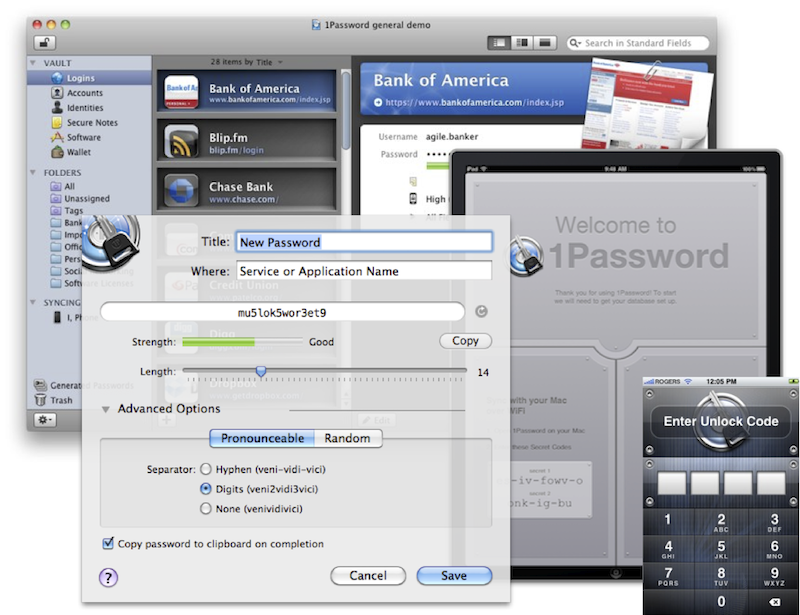 That being said, the Mac version is the deepest and most feature-rich password manager of the three. With full multi-device Dropbox sync support, complete browser integration with auto forms, and a truly unique feature called 1Passwordanywhere that proved to be quite be useful when installed on a USB key, 1Password does earns its keep. It has a polished look and feel throughout and gives you control in places you never knew you wanted control. I was originally tempted to settle on 1Password without trying alternatives, but I never would have met mSecure had I done that. With its simple design and straightforward approach to managing passwords, it’s everything almost anyone would ever need in a password manager. I would definitely recommend it for the $20 complete price tag. While DataVault was certainly more of a match in features to SplashID, its user interface and overall design left me wanting, quite frankly, less. Which brings me right back to 1Password. It’s definitely the most expensive password manager out there. Is it worth it? You do get what you pay for. But if you don’t need all the features it offers, then perhaps mSecure is the right-sized solution you need. KeePass is another one which should be considered. It has versions for Windows, iOS, Android, Linux and I’m pretty sure Mac, too. Combined with Dropbox (or your other favorite syncing service), you can access your password database across your devices and computers. My 2nd choice would be 1Password and my 3rd choice would be Keepass. All three are multi-platform including the iphone. Each with different pros and cons. I realize this is an article about ALTERNATIVE password managers but, even with this recent security issue – which, imho was dealt with very professionally – I still believe LastPass to be the best service / app out there. I’ve tested many password managers myself but in order to have one solution for multiple computers, multiple browsers and multiple operating systems it’s still the best. Wallet (Mac App Store $19.99, iOS Universal $4.99) is definitely the best solution out there and worth every cent. I do not even consider to buy anything else. Mr. Goetz :-) very well-done written piece! No mention of MyKeePass for users of KeePass on the desktop? I bought MyKeePass and quickly gave up on it. I never could figure out how to import my desktop Keepass database file and switching out of and back into MyKeePass requires you to re-enter the password which was very annoying. I’ve also read reviews in iTunes App Store from users complaining about the lack of updates. The developer states that he only works on the app in his spare time. I’m going to try mSecure and DataVault and resort to hand-entering info from my Keepass database. It’s worth noting that 1Password has a pretty lenient policy about use on multiple computers; the family pack is only if you’re going to be using it on multiple computers at the same time. If you just need it on your home and work PCs, you can get one license as long as they’re the same platform. Thanks for including DataVault in your comparison. The current price of DataVault for iOS is $9.99. DataVault for Mac is on sale for $9.99 as well. See link below for more info. Useful article, but I’m surprised that you ruled out SplashID so definitively. I transitioned from a Palm to an iPod, and decided to stay with SplashID on the grounds that it had always worked well for me. The sync speed is reasonable (in a test I just did, which involved comparing more than 1000 records and probably transferring 3 or 4 in either direction, it took 12 seconds, which is acceptable for a once-a-day task) and I haven’t seen anything I’d call “multitasking problems” on either the desktop or the handheld. My main issue with the software is an infrequent bug on the desktop client that can sometimes cause the record display not to update; I haven’t checked to see if the newest version fixes that. But overall, I’ve found it reliable and functional. Your mileage may, of course, vary. I have run into several corrupt database issues, lots of crashes, and had to jump through hoops to sync one account to multiple iOS devices prior to the latest release. One missed step or setting in the sync process and you would up with lots of duplicate records. On the multitasking issues, that is where the majority of crashes seem to occur. There was also a timing issue with the animations where one could see the account information including the unmasked password before the screen would lock when task switching back and forth between other apps and SplashID. The latest release started challenging me for my master password each time I access the App, and they removed the ability to change the setting associated to the timing for auto locking. I never has a single issue on Palm. Not one. SplashID was rock solid from the first I started using it. In fact, SplashID on my Treo 650 was the number one reason I did not get the first iPhone. I was also a huge SplashBlog freak, and feel that even today there has not been a better solution for mobile photo blogging since SplashBlog. It was a shame they sold it to SixApart, and SixApart killed it. I just decided it was time to look around for something different. The latest update to SpalshID is what caused me to bail. It removed the auto-lock timing and requires a password every time time you switch back to it. I put up with all the desktop sync issues with previous versions because I didn’t want to deal with switching, but I’m finally saying goodbye. Thanks for the insightful article. It is not surprising you like mSecure, Ray Marshall was the developer on the Treo version of SplashID and is now the iOS developer of mSecure and owner of mSeven Software. Incidentally, I was the developer for the SplashBlog web site. We are focused on making software products for mainstreamers, so I was happy to see you validate as much. I use iAccounts and I find that it satisfies my needs except for it’s short PIN. Well worth a look. I also installed strip and tapforms when the were free. They also look good but I have really tried them out yet. You forgot a really important part of 1Password: not only all iOS devices and the Mac, but also Android and Windows…. it serves everything and auto-syncs in the clouds between every device and OS as long as you have a connection.Not to mention that these people know how to design an interface that feels completely native to the particular platform that it’s on (as opposed to a Windows program ported for Mac, or visa versa – it looks at home). I think that pushes it past the other options. Then again, I’m incredibly biased since I use it. I completely agree with you. It is the best of all of the password managers, and has the most features of all of those reviewed here. But that comes at a price. And if your needs are simple, you will be paying for more than you need. I still think that mSecure is the best solution for the vast majority of Apple users out there. That being said, since I have already paid for 1password across the board (got the desktop client as part of a bundle), that is what I will be using. I did not totally ignore them. I did take the number of people that rated each app into consideration. I do tend to trust scores on free apps less than paid apps, since may will bump up a rating a star or two just because it is free. And in this particular instance, there were several options in the 4+ category of paid apps. Iâ€™ll try again. The first time I clicked submit my comment just disappeared! How easy and what was the procedure for importing SplashID data into each of these programs? Problems importing data? Not very easy since I have modified a large number of my accounts by editing the name and location of the field. The data is preserved in the transfer, but you will be making a lot of edits to transfer from one tools way of looking at things to another tools way of looking at things. mSecure for example does not have categories. Rather than transferring all accounts over in one big move, I would recommend migrating them over in smaller chunks. That way you can better control the mapping of field level items more directly, and even edit the exported CSV file before importing to ensure a clean import. I am also a SplashID user. I keep a PalmOS device alive as a SplashID backup. My questions: How easy is it to import/convert SplashID databases into each program, and what is the procedure. Any problems? I was an SplashID for many years until I got frustrated with all of the bugs. I now use mSecure and it has a direct importer for SplashID data so the process to get the data converted was very simple. I’d highly recommend mSecure. I was a SplashID user for many years until I got frustrated with all of the bugs. I now use mSecure and it has a direct importer for SplashID data so the process to get the data converted was very simple. I’d highly recommend mSecure. I took a quick second look at eWallet last night based on your question. It did not make the cut based on my search criteria where I was looking for Apps that scored 4+ stars. Based on what it has to offer, and how it focuses on design, it may be a better alternative to DataVault, but would ultimately not alter the final conclusion I came to. mSecure would have remained my first recommendation for most Apple users, and 1password would be for everyone looking for more features and a much deeper experience. That does not mean that either DataVault or eWallet are bad Apps. There are several good password managers that didn’t make the Geoffrey’s list. Brighthub has a good comparison that looks at ten of them, some of which are less pricey.